Protesters gathering near the venue for this year’s G7 numbered 3,600 according to police, and 4,500 according to therally’s organizers. They were outnumbered by police, whose ranks reached 17,000, further strengthened by a 2,000 strong Austrian contingent on stand-by across the nearby border. Police used pepper spray when a group of protesters tried to break through their cordon, resulting in brief scuffles. As a result, one protester was carried away on a stretcher by paramedics. Police at the spot later told RT’s Peter Oliver that it was the protesters that used pepper spray first. One officer was seen receiving medical aid. 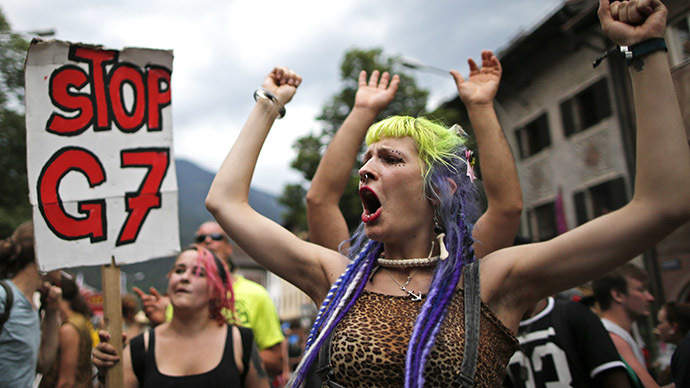 The crowds blame the G7 for poverty and oppression. “What we bring here is protest against capitalist globalization, where people get impoverished every year more. We represent Italy and Greece here in Germany. We represent an international group that fights this summit of oppression and of capitalism,” Simon Ernst from the Stop G7 Elmau movement told RT. In particular, they are opposed to the Transatlantic Trade and Investment Partnership (TTIP), an international trade deal currently being worked out in secret, fearing it will harm Europe’s economies in favor of trade with the US. The protesters were also unhappy about the costs of the summit for the host country, with delegates enjoying a 2-night stay in one of Germany’s most luxurious hotels guarded by a massive police presence. The G7, which is comprised of Germany, the UK, Canada France, Italy, Japan, the US and the EU, is set to discuss global economic recovery, including Greece’s debt to the IMF and other creditors. They will also tackle issues such as climate change, fighting epidemics, the turbulence in the Middle East, and the resurgent violence in Ukraine. This is the second such gathering taking place without Russia’s participation. Moscow was excluded for what the G7 nations called “the annexation of Crimea” in March 2014.